An impressive feature of Panama’s skyline is the Trump Ocean Club. Now you can play there. The new Ocean Sun casino opened to the public on September 12, 2014. The venue is on the first floor, but there is a premium casino on the 66th floor for high rollers. Trump Ocean Club has had it’s ups and downs, but there it is in all it’s glory. Inspired by the Bahrain World Trade Center, the tower is one of the most prominent of the countless new skyscrapers completed in the last five years that now grace Panama City. With an estimated US$105m investment, the new Ocean Sun Casino is an ambitious project in Panama. The casino is located on the first floor of the Trump Ocean Club Tower in Punta Pacifica, with several areas for live entertainment and gourmet food service. On the 66th floor, with a panoramic view of Panama City, is the country’s first and only premium casino. The floor also houses six luxury suites that come with personalised service. It is owned by Sun International whose first entry into the Latin American market was in Chile with the Monticello Casino. OCTOBER. 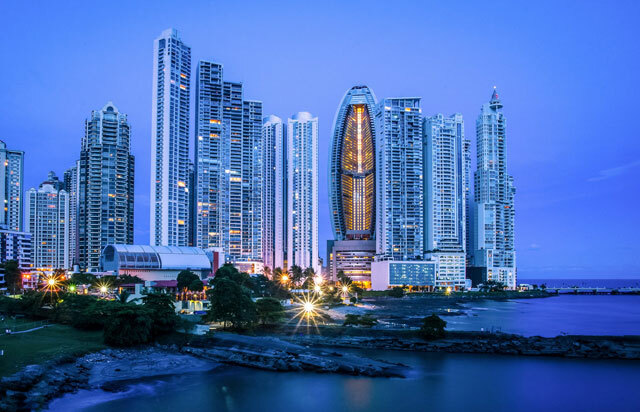 Trump Ocean Club International Hotel and Tower in Panama City, Panama, proudly announces the closing of a $45.5 million deal with Sun International Limited that bring´s the world-renowned casino operator to Panama’s most prized hotel. This partnership will introduce superior entertainment and an ultimate guest experience that is unparalleled in Latin America. This partnership will introduce superior entertainment and an ultimate guest experience that is unparalleled in Latin America. Encompassing 75,000 sq-ft, the casino occupies the second level of the 369 room award-winning hotel. It includes 32 gaming tables for blackjack, poker, roulette and baccarat, along with a superior collection of 600 slot machines showcasing numerous diversions for both the amateur and experienced gamer. Additionally, a fine-dining restaurant and revué bar & lounge offers guests the finest of dining and entertainment experiences. On 66th level of the hotel, Sun International presents The Panaviera, an exclusive gambling space reserved for VIP guests. Here, the most valued clientele will also find an elite restaurant and lounge, with private suites available to a select few on the 65th floor, immediately below. Sun International plans to invest a further amount of $60 million to build-out and fully develop the multiple spaces. Based in Johannesburg, South Africa, Sun International is a globally recognized public company with an impressive portfolio of 27 resorts, luxury hotels and casinos operating in eight countries. Within Latin America, they own and operate the Monticello casino in Chile. The company prides itself on successful leisure group offerings focusing on superior gaming, hotel and entertainment experiences that exceed customer expectations. OWN PANAMA. Whoever said less is more never had more. And they’ve certainly never stayed at the Trump Ocean Club® International Hotel & Tower Panama. Rising 70 stories above Panama Bay along Punta Pacifica’s pristine peninsula, this luxury hotel in Panama City, Panama unites exclusive amenities, innovative accommodations and the signature services of Trump Attaché™. Trump’s sleek design evokes a majestic sail fully deployed in the wind. This Panama hotel is the tallest and largest building in Central America, with a landmark address that’s redefining luxury in Panama. Steps from Punta Pacifica’s sophisticated shops and nightlife, five minutes from the financial district and minutes from Panama City, this top hotel in Panama gives you the perfect setting to unite business with pleasure. Whoever said less is more never had more. Unique among the world’s finest hotels and resorts, Trump Panama delivers a superior level of modern convenience including meeting facilities outfitted with sophisticated technology. The 13th-floor deck features five radiant pools with waterfront dining. Staying true to Trump’s unmatched reputation for excellence, every aspect of the tower has been designed to showcase some ocean views, and each of the 369 hotel rooms and suites is exquisitely furnished in an elegant, cosmopolitan style. From the soon to open international casino to gourmet dining, this is opulence at its absolute finest.